and reduce fugitive or explosive dust risks. and reduce your overall energy usage. We provide solutions for commercial, industrial, and institutional facilities. Our custom solutions, featuring SonicAire Fans and Nilfisk vacuums, are designed to eliminate silica dust and fugitive combustible dust in your facility. We work on-site with Plant Managers, Engineers, Safety Professionals and Business Owners to dramatically reduce operating expenses. Custom solutions are designed to improve facility appearance, workplace safety and functionality. Say goodbye to the headaches over compliance when it comes to keeping your facility clean and safe. Our goal is to achieve “Conservation Without Compromise” in every project. Every solution we offer provides a compelling ROI with little or no out-of-pocket expense. Our proposals are detailed, straightforward and outline the numbers and results you can expect from us. As Safety Managers, Engineers, Business Owners and Plant Managers, you know the challenges that come with material handling and housekeeping. There are many industries that have to consider NFPA compliance as well as the basic housekeeping that OSHA requires. Combustible dust compliance is generally required in Food and Grain Manufacturing, Wood Manufacturing, Paper Manufacturing and various textile industries. In fact, almost every manufacturing process includes one or more dust-creating steps before it’s through. You are the expert on your facility processes and we are the experts that will help you keep it clean, functional and safe. We distribute our products and provide world-class turnkey service when needed. Combustible dust doesn’t wait to react and you shouldn’t either. Make sure your facility is prepared and compliant. SonicAire fans and Nilfisk vacuums are our two most effective solutions for eliminating and preventing the buildup of fugitive combustible dust and we are experts in both. It’s easy to start the process with us; simply request an audit. The lighting that we have is top notch. Orion and MaxLite are only a few of the brands that we have in our line card. LED High bays and retrofits are what we primarily install. Some of the industries and institutions we have installed LED lighting for include commercial laundry services, healthcare laundries, schools, expo centers and many manufacturing facilities of all types. LED lights lower energy consumption significantly in comparison to fluorescent lighting. Also, traditional fluorescent lighting generates significant amounts of heat and this can create serious safety issues. When combustible dust settles on light fixtures, especially ones that generate a significant amount of heat, the risk of a dangerous explosion increases dramatically. We can significantly reduce the dangers from combustible dust with our SonicAire fans and replace the lighting with LED lights to both lower energy consumption and remove excessive overhead heat created by outdated lighting. If you haven’t experienced LED lights before, then you’re missing out and losing money. It’s part of our mission to help you understand and know the difference that quality LED lighting can make for your business. LED’s last 10 TIMES longer than any other kind of lighting and provide your facility with the safety and functionality that it deserves. To top it off, energy suppliers will pay you incentives for us to install LED lighting in your facility. We work to connect you with incentives that your energy supplier provides. You won’t believe your eyes or your ROI once you have your lighting upgraded to LED. There’s no reason to buy anything other than LED lighting ever again and we make it easy and cost-effective for you to make the switch. We can help determine whether you would qualify for any number of available incentive rates. 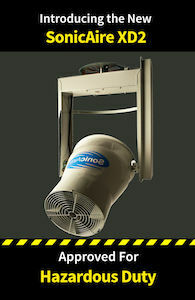 View a few of our efficiency lighting and combustible dust fan installations.